It’s not like you need a degree in zoology to apply insect repellent, but there are a few important techniques to keep in mind. For instance, did you know you can’t just spritz an arm and expect your entire body to repel mosquitoes? It’s true! Nor can you walk through a mist of repellent and hope for the same. Alas, eau de toilette this is not. Read the instructions to see if you need to shake your OFF!®. If so, shake first, and then hold it 15-20 cm away from exposed skin and clothing. Spray in a slow sweeping motion. No need to let it “set”—it works immediately. Don’t apply your protection out of order. We recommend that sunscreen go on first, followed by insect repellent. Don’t apply on cuts, wounds, or irritated or sunburned skin. Use just enough to cover exposed clothing* and skin (see the next step for instructions on applying to the face). Use your hands to evenly moisten exposed skin. Remember those easy-to-forget areas, like the ankles and behind the elbows. And know this, products with a higher percentage of the active ingredient do not offer stronger protection. They just last longer. So choose a product that suits the amount of time you plan to spend outdoors. *For DEET-based products, do not apply on or near acetate, rayon, spandex, other synthetics (aside from nylon), furniture, plastics, watch crystals, leather and painted or varnished surfaces, including automobiles. Keep OFF!® repellent out of children’s reach. Don’t allow children to handle the product themselves and don’t apply it directly to their hands. Instead, follow the same “hands first” method. Spray the palm of your hand first, then put the product on children. 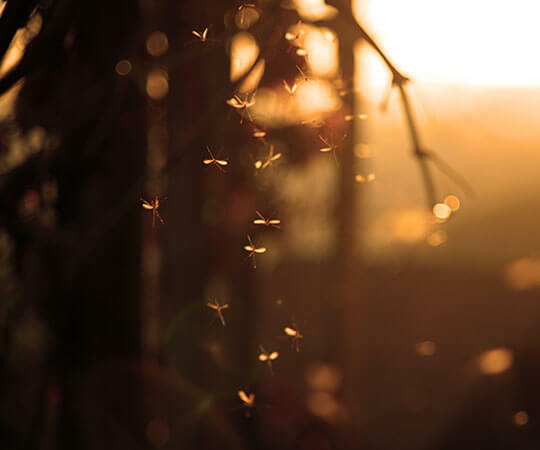 Mosquitoes can bite through clothing that is not woven tightly enough. Apply repellent to clothing to prevents bites. Spray shirts, pants, socks, and hats―but don’t spray under clothing. To help protect against ticks and chiggers, apply to cuffs, sleeve openings, socks, and other openings in outer clothing. Wash all treated clothing before wearing it again. Note: OFF!® repellent won’t damage cotton, wool or nylon—but if it contains the active ingredient of DEET, do not apply on or near acetate, rayon, spandex, other synthetics (aside from nylon), furniture, plastics, watch crystals, leather and painted or varnished surfaces, including automobiles.